In the living room, the vintage 1980s Venetian glass chandelier is from Jean Marc Fray, Austin; pair of antique Italian chairs are upholstered in Robert Allen High Performance Velvet; the coffee table is Hickory White with custom metallic lacquer by Paloma Creations; pair of vintage mohair sofas and pair of vintage leather chairs. Bookcase holds various flea market finds. 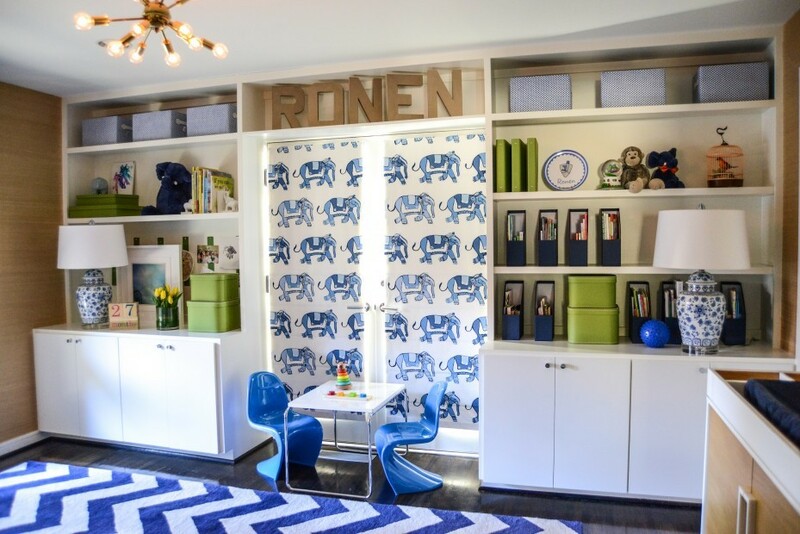 In the child's room, a wool chevron rug from IBB Designs; custom Roman shades in “Parade” Blueberry/Ocean- Lulu DK for Schumacher; Slither chairs in blue from One Kings Lane; blue and white Chinoiserie lamps by Oscar de la Renta. From the kitchen, a view into the family room. Shelly's collection of design books. 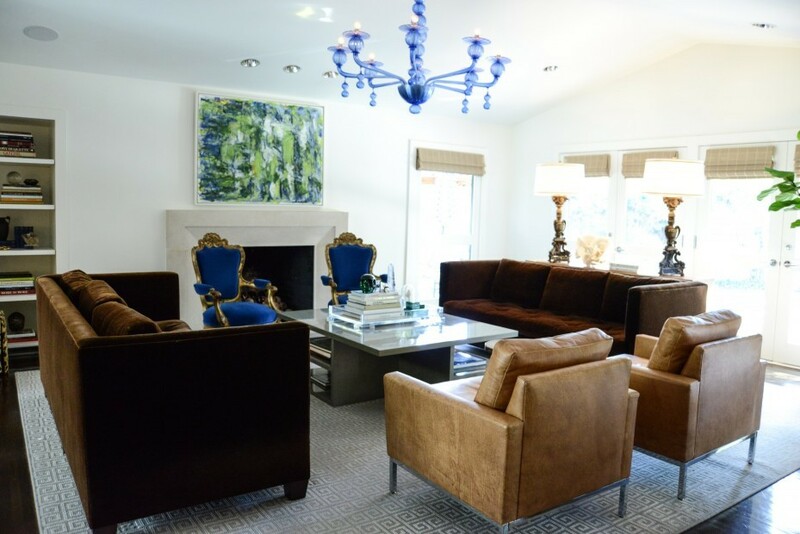 Left: In the living room, the vintage 1980s Venetian glass chandelier is from Jean Marc Fray, Austin; pair of antique Italian chairs are upholstered in Robert Allen High Performance Velvet; the coffee table is Hickory White with custom metallic lacquer by Paloma Creations. 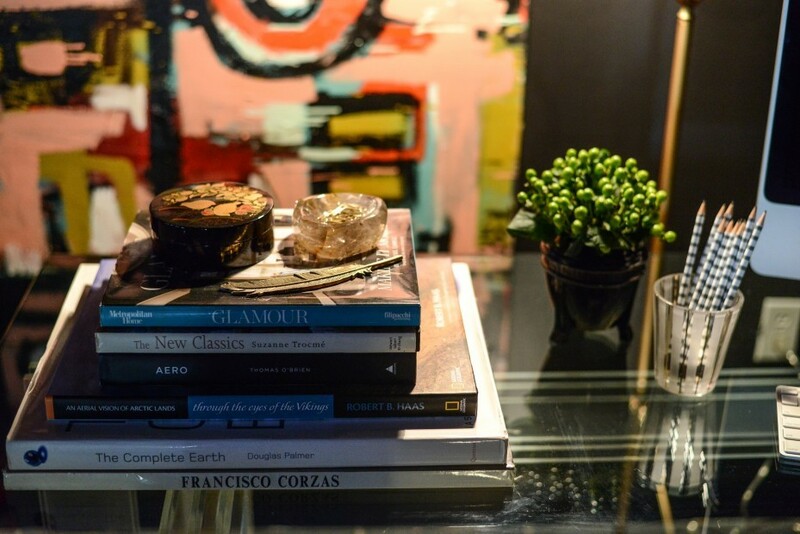 RIght: On the coffee table, a Lucite box holds a rotating collection of found objects, including malachite boxes, green glass skull, crystals, seashell under glass, a beetle, ceramic needles artwork is by an artist from Gallerie Noir. 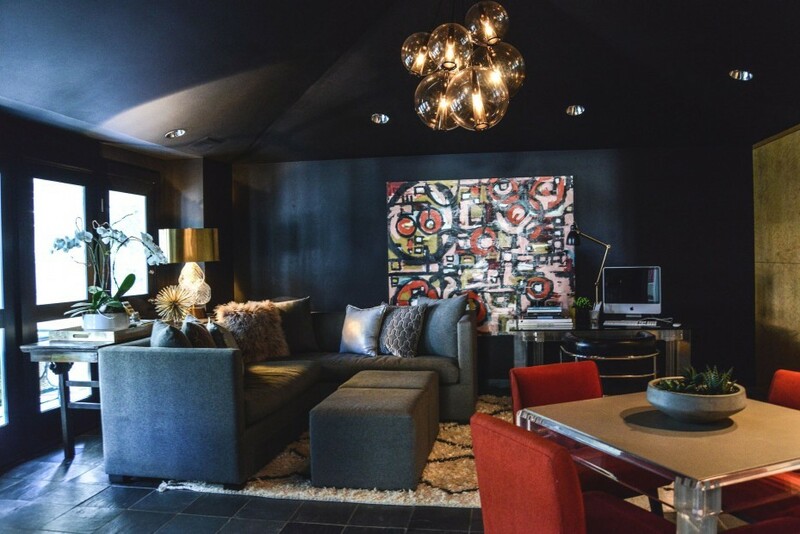 Custom sectional and ottomans designed by Shelly and made by Paloma Creations; midcentury chairs and vintage acrylic and leather games table from River Regency; Wall color- Tricorn Black by Sherwin Williams;Venitian glass and brass lamp by Arteriors; caviar chandelier by Laura Kirar for Arteriors. 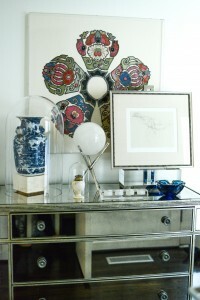 Shelly Rosenberg; the antique mirror is a gift from Barry’s mother, and was refurbished by Brown Mountain Art. Mom, designer, writer…in that order! I have dual degrees in Public Relations and Interior Design. I am a passionate advocate for the creative community…I love working on design projects, but I also feel strongly about strengthening my industry taking some of the ambiguity out of the important work we do. Improving environments is a lot more than just creating a pretty space. I help my colleagues brand themselves in a sophisticated, yet approachable way. Anything goes, as long as it is well edited. I give a lot of thought to function and durability. 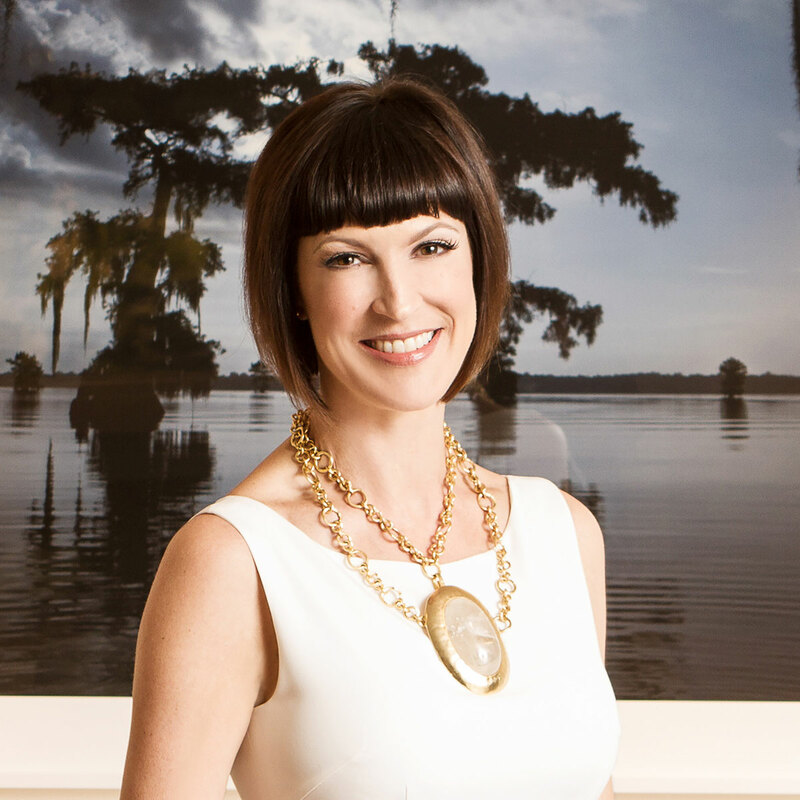 A savvy client will want to make their design investment last and I have perfected high design with families in mind. Style shouldn’t be scarified just because you have small children. There are elegant commercial-grade and outdoor materials that would really surprise you! Houses have true character when the client’s personality shines through, so it is just as important for the client to be moved in some way for me to include a product or idea. I know how to help clients co-create personal spaces they can connect too. I actually like the collaborative process. It’s not all about me. DID YOU USE A DECORATOR? IF SO, WHO? HOW DID YOU CHOOSE THEM? I grew up with decorating in my blood. 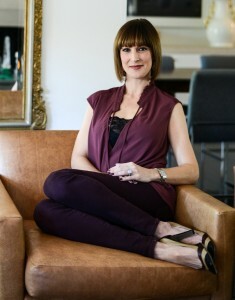 My mother is a nationally published designer and owner of Stockton Hicks Laffey, an Austin showroom, exclusively to-the-trade. I’ve been exposed to the best art, architecture and design in the world and I incorporate that global view into my own home. I love clean lines, a rich mix of materials and modern art. I absolutely have to have objects with history. If everything is too studied, or too new, there’s no soul. 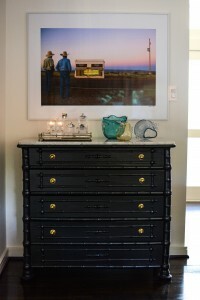 Antique bamboo chest, reworked and lacquered by Paloma Creations; hardware from Elliots; photograph from Prada Marfa series by Gray Malin; art glass is by Aaron Thane Tate. Paint is such a fabulous tool to create mood. I’m careful, though, to stick with timeless sophisticated color. I always choose a hue with a bit more gray in it than I think I want, choices always look brighter once they’re up on the walls. With an unlimited budget, I would use anything by Farrow & Ball or Donald Kaufman—their products have higher-level pigments that makes for rich, deep finishes. My walls are Pratt & Lambert “Seed Pearl” white and Sherwin Williams “Tricorn” black. I have to say I am turned on by color! However, I respect how a neutral base will really showcase vivid shades. It is all about balance and composition. 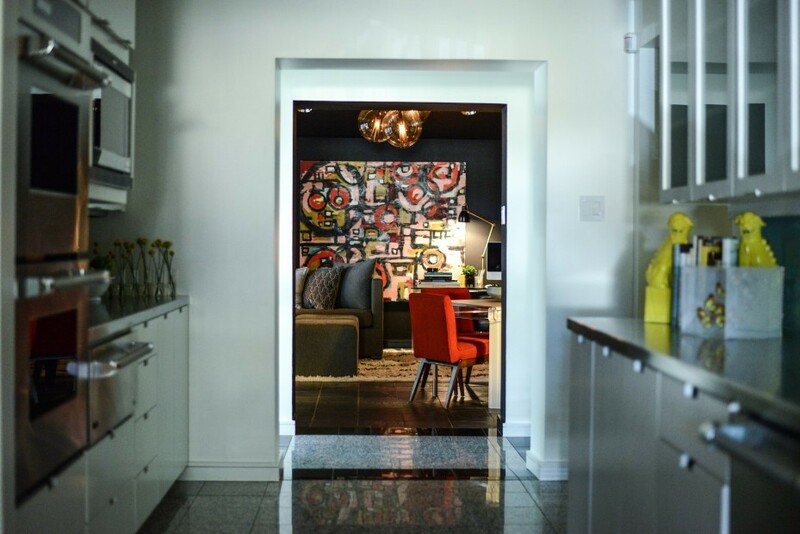 Bright, colorful rooms can be great fun, but it takes a well-trained eye to maintain harmony and keep that energy tolerable. 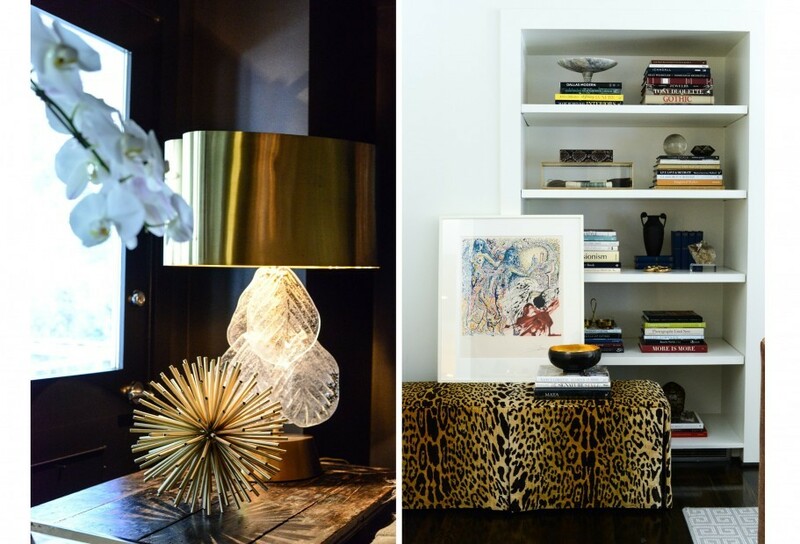 I am fascinated by other designer’s own homes…perhaps it’s voyeuristic, but I’m intrigued by how designers like Miles Redd, Kelly Wearstler or Jamie Drake—artists that have access to the best of the best experiment and design their personal spaces so fearlessly! I have to say the airy living room inspires me most. That pure, white canvas allows me to play with my compositions and make changes when the mood strikes. The furnishings begin in the 1800’s and come all the way into this decade. 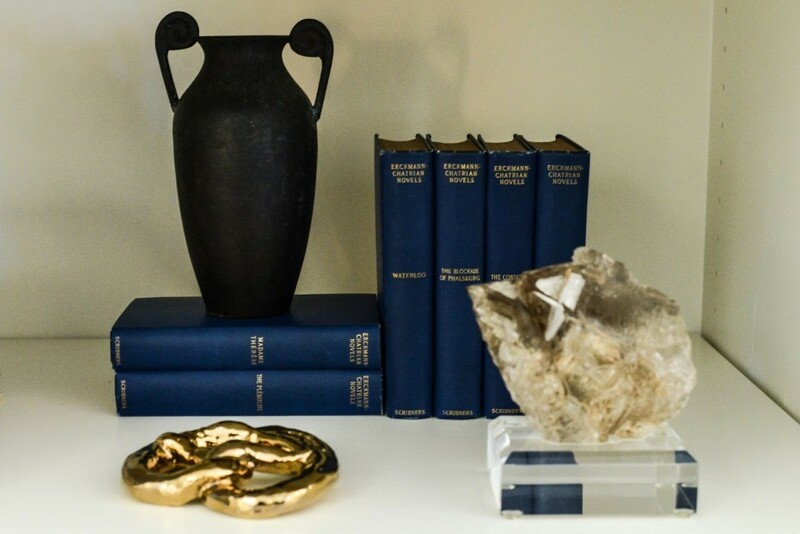 And every piece has a story—many of them have had multiple lives in all of my past homes. Not only is there is a lot of sentimental history in this room, new memories are being made everyday. My decadent mohair, leather and velvets wear like iron, so my children can have unlimited access to luxurious surroundings. The den is a cocoon where my whole family loves spending time together. The custom sectional, by Paloma Creations, can easily hold all of us at the same time, we all dog-pile and watch movies. And yet, the room is super functional with separate spaces for reading, eating, working on the computer…we can all hang out while working on different projects. Probably the kitchen! Doesn’t every mother? I am organizing and feeding a family of six, and we all eat at different times, so I am in and out of that area all day. I like to have a lot of room to move and I don’t like an island in my way, so the galley style suites me. Plenty of storage allows me to hide almost everything so I feel serene and in control—if that’s possible! The watery blue-painted glass and sunny yellow accents make for a cheerful command center. I adore the floor plan of the formal rooms—both are open to the entry of the house. Your first step inside, you see that expanse of space. I knew I needed a “bride” for the room—the piece that all else centered around. I was very pregnant with my son when we purchased this great house, so I was not up for shopping as usual. 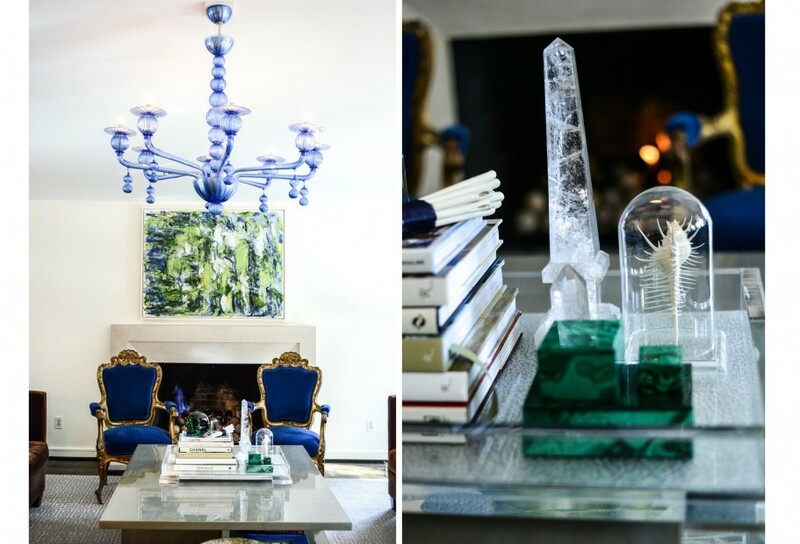 So, I turned to trusted sources online and fell in love with the 1980’s cobalt blue, Venetian chandelier from Jean Marc Frey. Despite the investment, I knew I would love it forever! With most of my budget spent, I refinished multiple pieces I already owned to get an entirely new look for less. POINTERS ON DECORATING A HOUSE FILLED WITH KIDS? I buy sturdy furnishings, tuck valuables into built-ins and incorporate soft materials that wear like iron: mohair, boucle´, scratch-resistant leathers and specialized out-door or high-performance blends or velvets. You just wouldn’t believe the options available now. They cost more up front, but make it perfectly possible to have adult design with a houseful of kiddos. A tropical locale with a sandy beach will always be my ideal get-a-way. St. Barth’s is a favorite because the island combines the best of an ocean-centered vacation with European shopping and French food. Always gorgeous books and something provocative to start conversation. Right now I have a Victorian-inspired collection, including a heavy glass skull, sea shell and scarab in lucite, plus crystals, malachite boxes and an unconventional stoneware sculpture of large sewing needles by artist, AM Martens, via Gallerie Noir. A bottle of great wine from my family’s Healdsburg, CA vineyard, Flax, is my go-to, but a close second would be beef tenderloin from the famous Perini Ranch in West Texas. I have a classic, heavy paper card, by Vera Wang for Crane & Co, monogrammed, of course! We spend a third of our lives in bed, so I don’t bat an eye when investing in fine bedding. Right now, my sheets, shams and duvet cover are Egyptian cotton, in lavender, with an embroidered monogram, by Matouk. I have my eye on some exquisite fine art photography from an emerging New Zealand artist I found on Etsy, of all places. If you have a good eye, you can find exceptional talent at all price points. I love La Marquise by Cire Trudon (at Urban Flower/Grange Hall) and Blue Garden by NEST Fragrances, NY.